At 05.15am I am ready to start the long day that I have ahead of me. The lady of the B&B had arranged an early breakfast and she has also informed me of the expected conditions of today’s hike. After leaving the B&B in the dark I walk back to the trail (approx. 800 meters) and I continue my way northbound. The first couple of kilometers are following the local road, easily, but they go steep uphill. By the time I arrive at the point where the trail goes into the fields the sun is up but hidden behind the clouds. The trail uses more fields than what is drawn on the map (it goes parallel to the road a few hundred meters) and this section turns out to be pretty wet marshland. After this parallel section, some 10 minutes, the signs stop existing and I decide to go to the right, northeast, straight in the direction of the hill where I am heading for. After one kilometer I see the signs again, indicating the direction that I am going. The weather is not great; cloudy and a chilly wind. I arrive at the top of the slope without problems or delays. For the first time this week I feel cold and after an inevitable selfie I continue my way quickly. Before going down the hill there is first a horizontal section that needs to crossed. The soil is very wet and slippery. Due to my rush to get warm and comfortable I don’t put my feet carefully on the slippery rocks and then it happens: my left foot slips away, my right leg tries to hold me up right but with no avail. I fall while turning my right knee sideways. Before I hit the soil I hear a crack in my right knee like a tearing knee ligament and I hit the mud. While I get back on my feet again I realize immediately that this could be the end of this hiking trip. The knee hurts pretty bad but I force myself to continue to move, to keep the knee agile. Making very small and safe steps I manage to make it to the end of the horizontal section (only some 100 meters). After carefully using the steps that cross the ever present fence I start going down the hill. This turns out to be a dry section of fields and not as steep as I had feared beforehand. Following the signs I arrive halfway down the hill at the farm where the trail leads to the comfortable local road. Still moving very slowly I continue my way down and at the foot of the hill, between two lakes, I take the first break of this morning. It is exactly the point where I have hiked 3 000 kilometers along the E8. I had hoped to be in better spirit that what I am right now. My knee hurts a lot, the sun has started to shine, the sky gets clearer and I sit down to consider my options. I would jepordize my health if I would continue following the signsl with going up and down the next hill (of which the lady at the B&B assured me that there where many marshy sections). I decide to skip the crossing of the hill and to go around the hill by going to the coastal road. This way will give me four or five extra kilometers but at least these will be comfortble to do: flat surface and hopefully also no steep up and downhill sections. On the other side of the hill the trail leads to this same coastal road where I can pick the trail up again. The local road that leads to the coast is easy and quiet. The coastal road is a much bigger challenge: it is narrow, considering the amount of traffic that passes by, and there are very few places where a pedestrian can make way for the other traffic to pass. I was hoping for nice ocean views from this road but most of the view to the left is blocked by bushes and trees. It is not advisable to use this road any more than strictily necessary. Fortunately after eight kilometers I can go into a parrallel road where the E8-trail joins me again. This easy road turns out to be pretty endless passing impressive examples of Irish real estate. After a few kilometers the trail leads back to the coastal road, to a very busy section with many unclear curves. Be very carefull while passing these 1.5 kilometers! 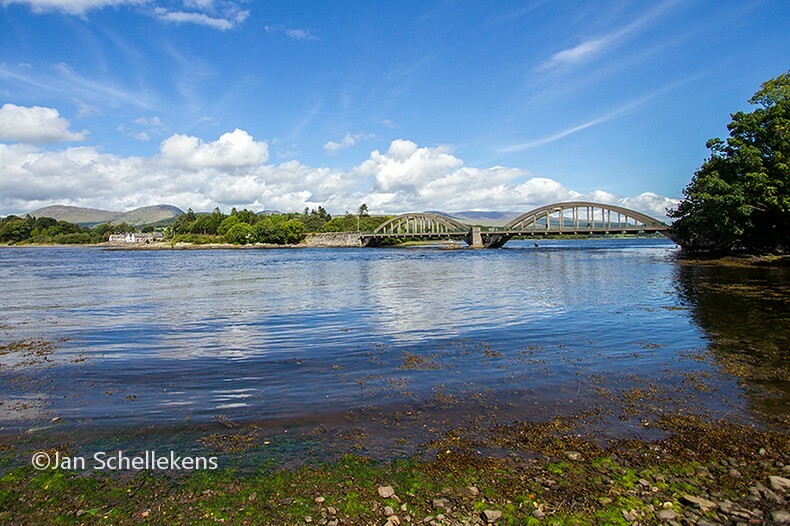 At the end there is the bridge that crosses the ocean, called Kenmare River at this point, and consequently the city of Kenmare (many hotels, B&B’s and one hostel, many shops and restaurants) on the north bank is reached. 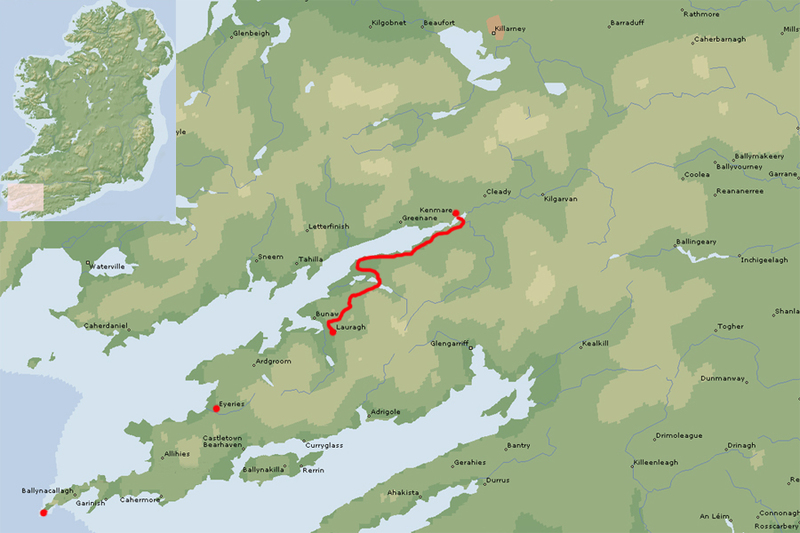 By crossing the bridge the E8 leaves the Beara peninsula and continues on the Kerry peninsula. I decide to stay here for two nights, allowing myself a day off tomorrow to give the knee a break. 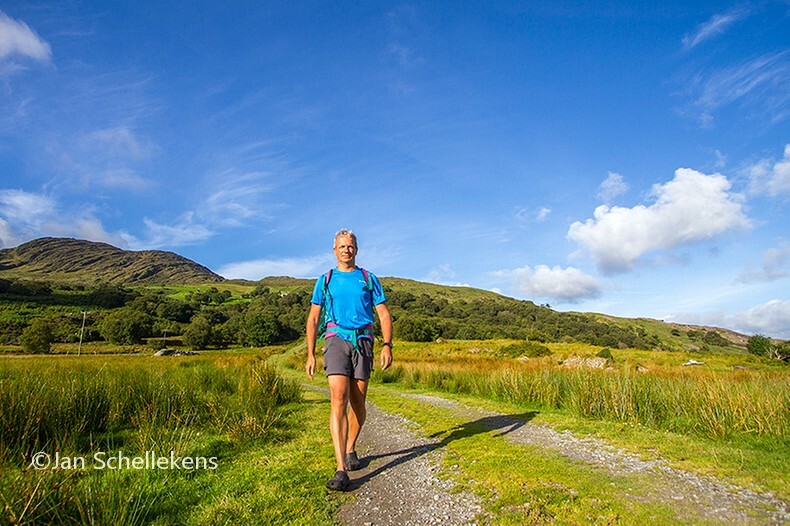 In the hostel where I stay there is a wonderful international mixture of active tourists: many hikers and cyclists who visit the Kerry peninsula and that are doing the Kerry Way, or a part of it, stay for one or two night in the city. Dit bericht werd geplaatst in 1 - Ireland en getagged met A-rating. Maak dit favoriet permalink.